Ice Cream Sandwich introduces facial recognition to unlock a phone: an application can do the same on Gingerbread. 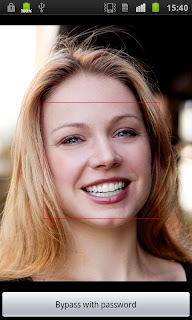 During the presentation of Android 4.0 (Ice Cream Sandwich), Google revealed a new feature: unlocking the phone using facial recognition. Unfortunately during the live, the Galaxy Nexus does not want to know whether it’s bad or good person. The conditions were not optimal can be. But owners of smartphones Gingerbread (and even Ice Cream Sandwich prior) will benefit from the same functionality. It even has a lock on some or all applications! If, however, if you knew it, one alternative is to enter a PIN or a drawing. All this is possible through the application Visidon AppLock (provided it has a front camera), which is offered in two different versions.